Real-life married couple Hume Cronyn and Jessica Tandy star as Frank and Faye Riley, the owners of a small diner in a dilapidated building that also houses their apartment in the slums of Manhattan. The rest of the tenants of the building are being paid off to evacuate ASAP, so that greedy land developers can take over and demolish the building in order to erect some high-rise corporate edifices. Those that refuse are being threatened with injury “or worse” by some local thugs that are also on the corporate payroll to scare the bejesus out of the remaining tenants. Without anyone to turn to, a desperate plea may have saved the day, as a couple of miniature flying saucers arrive, consuming metal materials and then fixing up damaged parts of the building. The saucers befriend the remaining tenants, although the thugs and land developers are determined to put an end to this new development even if it costs lives in the process. 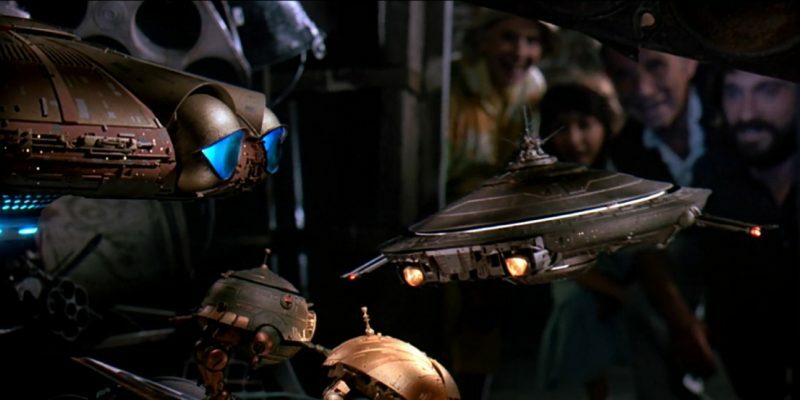 Steven Spielberg produced this quaint sci-fi fairy tale.